» New game coming out! » Cycle of Random Thoughts! My name is Eric, and I am particularly a fan of the expanded Madokaverse. Having already watched the anime, I currently own Homura's Revenge, The Different Story, Oriko Magica, Extra Story, Kazumi Magica, Suzune Magica, and v. 1+2 of Tart Magica. I also run a group on deviantArt called Job Offers, where people can commission one another for stuff they'd like (but not offer commission prices and such; there are other groups for that already), and both my avatar and my signature are things I had commissioned two different people for. 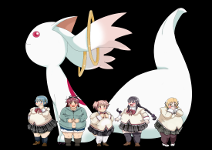 I've also commissioned someone once for a fic that some of you might not be comfortable checking out, and currently seek to reboot that, but if anyone's interested, it's called Cibus Esculentus Madoka Magica, and also has a page on TV Tropes. Hi, nice to meet you~~Do you like any animes other than Madoka? Hi there! Glad to see a new face around the forum! ^^ Who's your favorite character in Madoka Magica? And is your avatar a character you came up with? I hope to see you around the forum lots! If you have any questions at all, don't hesitate to ask me! Can't say I have a favorite character per se; they're all unique, really. My avatar is a redraw of Pia Undo, who appears exclusively in a crossover w/ Divine Gate and also has her own wiki page. You can find the full-sized version and even a lead-up pic in my deviantArt gallery (username: DMXrated). Anyway, if you haven't already read what I sent you on dA, I hope you appreciate that and enjoy the LiveJournal entry I linked to. In case you haven't noticed, I really like Sayaka Miki. My signature line? It's what Kyubey says when he successfully appoints new Magical Girls after granting them their wishes. The image pretends that he's just appointed all the main five at the same time. That I know. But I couldn't figure out what he means here. What he means here? Same thing he means when he says it canonically. He's just granted the girls their respective wishes, and in doing so, has conserved or even created more energy that the universe runs on by fulfilling certain processes that would normally consume it or are often otherwise impossible. Not sure how to explain any better. Mind being more specific? Actually I only have rough guesses how this whole wish granting process goes. And I'm quite sure that nothing the Incubators do can ever break the laws of thermodynamics. Otherwise they wouldn't even need the girls to gain new low-entropy energy. But they seem to rely on them, even in Madoka's world. So he might mean that the energy is created when the wish is made, it's just harvested later...? Beats me. It would be nice to see the energy expense and return of the whole cycle, and I'm quite sure that there are no canonical figures about it :D A magical girl who is killed without turning into a witch must be net loss, but how big...? If the invested energy would be significant QB could hardly benefit from the process. I always thought that it's the girl's own 'magic' that realizes the wish, QB just removes the obstacles. But why can't do they do more unconstrained miracles instead of using a limited set of magical abilities...? So it's full of shady details and even I couldn't explain them in my works... Especially that breaking the girls' contracts is a standard procedure in Girls Of Science Era. What's the energy balance in this case...? I'll need to speak to a friend of mine who is a lot more analytical about this, and then start a new thread on it. Hello! Nice to meet 'cha! I really like your avatar, it's very cute :D I'll have to check out your DA group, as it sounds pretty cool xD!